Calories: Chicken Tendercrisp: 689 kcal, Double Rodeo 360 kcal, Breakfast in Bread 579 kcal & Hash Browns 192 kcal. Total 1,820 kcal minus 1.5 buns. Admiral Burgerbar likes a secret menu item… it’s no “secret”… so imagine my little face when this popped up in my inbox on Monday morning. 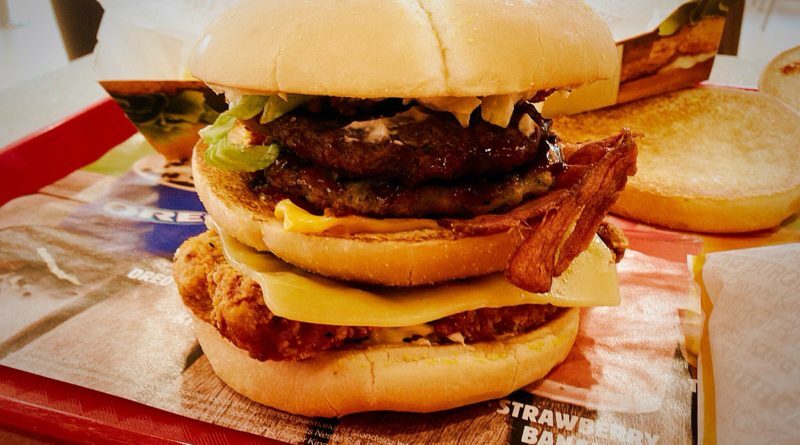 We weren’t sure what to name this complete mountain of greed. The Beast King? The Have it ALL your way? 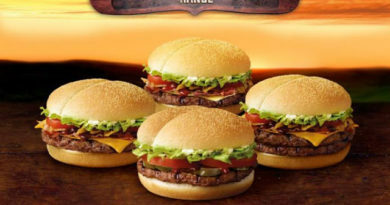 Maybe the Proud Whopper? 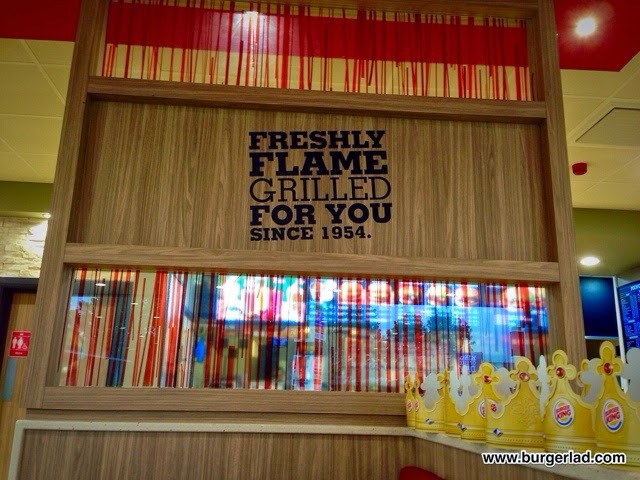 Not sure on any of those to be honest so it was Burger Lad® that came up with The Bling King. Well, it’s probably time for a secret menu item again. I had a look on the internet to see what things people had come up with. Didn’t find anything that grabbed my interest, so it was thinking cap time. What could I come up with by myself? Perhaps something that gives me my five-a-day. A sort of Land, Sea and Air Plus, or Platinum. Or Platinum Plus even. Fish, Chicken, Beef, Bacon and Sausage. 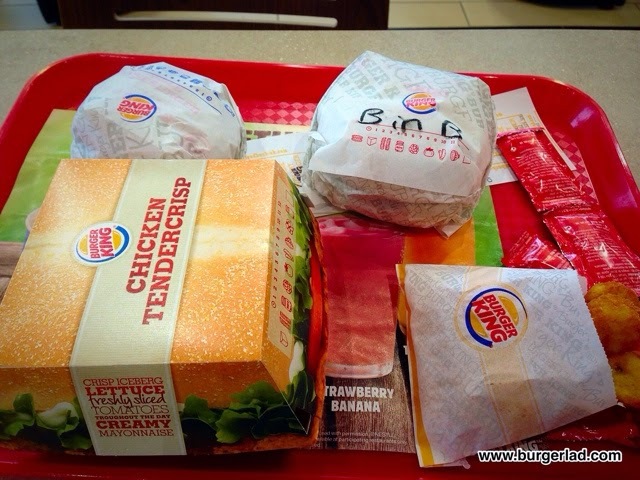 So I had a look at the BK menu and started building my own burger. 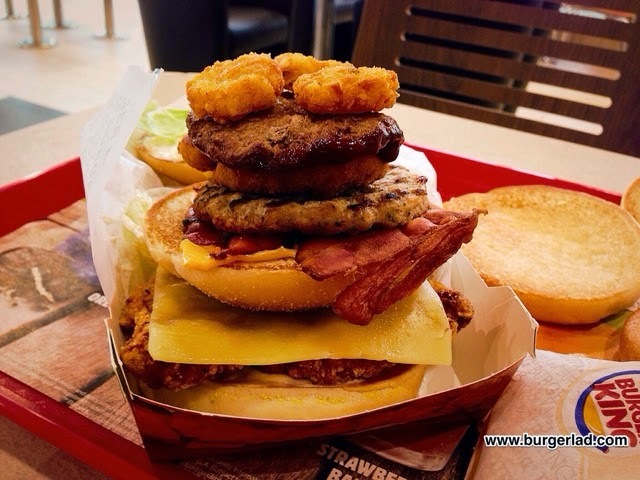 If Burger Lad® can do it with great success at McDonald’s, then how hard can it be? The Breakfast in Bread gives me the sausage and bacon, the Rodeo gives me beef as well as onion rings and BBQ flavour. The Ocean Catch gives me fish and tartar sauce, Chicken Tendercrisp with cheese gives me, well, chicken and cheese. And I’ll add hash browns to the mix, just because I can. Seriously, do you want to make these a meal…? I pull up to a Burger King, trying to time it correctly. 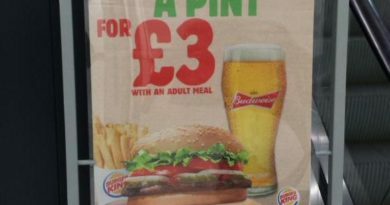 I am aiming for half past ten, so there is a chance the breakfast item might still be made, as well as the ‘lunch’ burgers (BL note – you can order ‘lunch’ burgers before 10:30am… a “friend” told me…). I think what I will probably do, depending on the height, is stick one of the spare bottom buns in the middle somewhere, just to give a bit of bounce to the otherwise heavy protein stack. I’m looking forward to my made-up burger. So, I went up to the counter, which was quiet at this time of day, and started to put my order in. 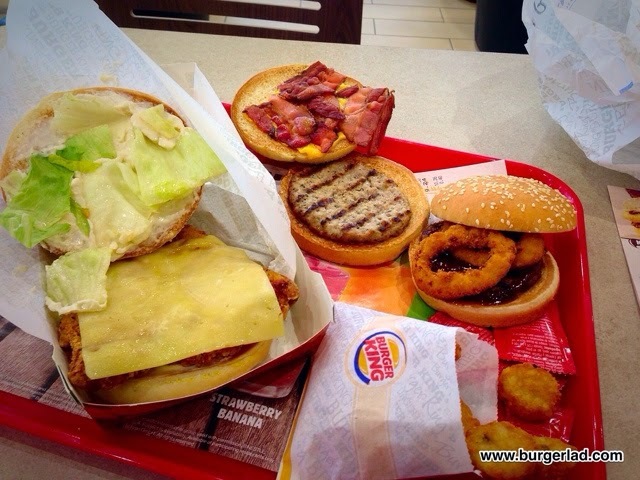 After each one I was asked if that was a meal, to which I replied… “No just the burger please”. It got annoying after a while, but I suppose the girl was just following the set sales procedure. However, my stunning creation came crashing down around my ears when we got to the Ocean Catch. “I’m sorry we don’t have that anymore”. I protested “But I was just looking at it on the website this morning”. The girl turned to the back and repeated that to a manager presumably, who replied “tell him we are sorry that it’s still on the website”. As the girl turned back to me I said “it’s ok, I heard that”. So, no fish in my creation. As we will see shortly, this wasn’t necessarily a bad thing. I took the Tendercrisp, which was the biggest thing, as my frame, and lifted its lid. Opening the Breakfast one, I could see all the bacon and cheese was stuck to the top bun, so although it was more rounded, it had to go in as the middle bread. On top of that I added the contents of the Rodeo, then three hash browns on top. The hash browns were tasty, but I sort of wanted something like KFC does – a big round hash brown that’s meant to fit the burger. With the stack built, I squashed the top of the Tendercrisp bun on the top, along with its white sauce. So far, so good. My first bite only got the chicken. I’m discovering with these tall creations that contents sliding out is a substantial issue. The other things didn’t fall out (yet) but kept moving to the back, so no matter which side I bit, I only got chicken. It was when I tried to tip it forward to get a bite of bacon, or beef, or sausage – anything instead of chicken – that things went downhill. The bun frame was degrading with the sauce. The stuff inside was all hanging out like a teenager’s dress-sense, and before long there was literally nothing dry to hold on to, and it just crumbled. I started out wanting to call this the Animal Farm, but perhaps the Total Mess would be better. 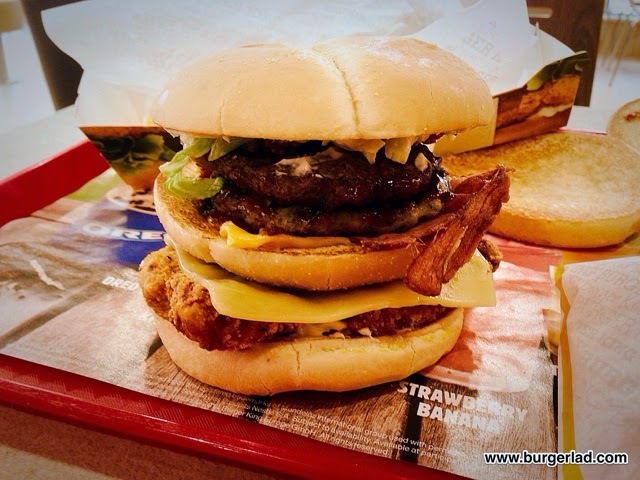 There’s clearly a reason why burger places don’t sell this kind of thing. Anyway, armed with a forest of napkins, I finished it off by picking random bits up here and there. By this point, it really didn’t feel much like a burger anymore, and I had to sort of accept that my creation was pretty poor. This was not Burger King’s fault by the way. The individual items were nice. The crispy chicken in the Tendercrisp was very nice, and I noted they do a sweet chilli one which I might try some day. The Rodeo was small, but the barbeque and onion rings flavour is very tasty. The breakfast in bread was interesting. I think this was the first time I had ever had had a proper breakfast item from one of the fast food places. The sausage, although reformed into a flat patty shape, was very, well sausage. In amongst the tower of competing flavours, the bacon did struggle to come through. I got it a couple of times, and it really depended what else my teeth managed to catch in the same bite before running away. As for the Ocean Catch, I emailed BK UK HQ later and despite the standard automated reply saying they’d get back to me within three days, I got a reply in a couple of hours. 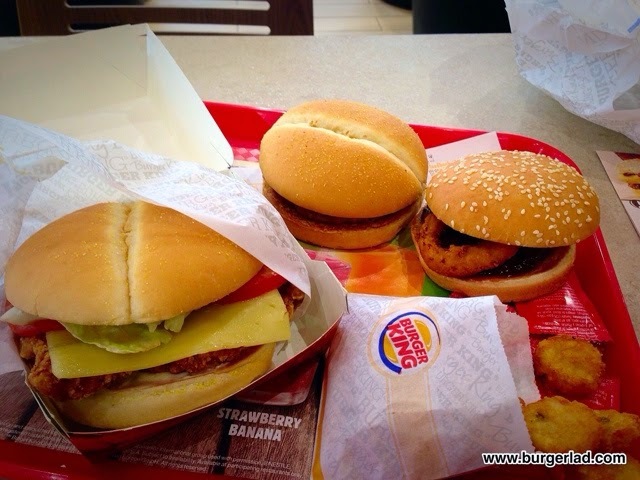 Effectively it told me that, as BK restaurants are franchises, there are some menu items that are discretionary. The one I went to obviously decided not to make the Ocean Catch available, but it’s unlikely to be removed from the website as the suggestion was that it is/may be available at other locations. Has anybody had a BK Ocean Catch recently? At any rate, whatever you want to call this – “Land and Air plus sausage and bacon but minus the Sea”, “Animal Farm” or “Total Mess”, it was a failure. Individually tasty items, and collectively tasty too, but I was far too pre-occupied with trying to hold it together to enjoy it properly. I won’t be having this again.